What makes eating something off of a stick so good? Is it the convenience so you can eat, take a photo and instagram your food in one fluid motion or is does it naturally just taste better? I’m thinking, one day, food on a stick is going to really taste better when someone invents a stick that is loaded with flavor to enhance the food. Wouldn’t that be cool? The 2014 Iowa State Fair boats some new food this year – on a stick. Below are some of the newest features to the fair, and the most Foodster options. Seriously, Iowa. How did we not come up with this first? We’re home of the Blue Ribbon Bacon Fest, and 19.7 million pigs yet Texas beat us to this idea. This treat originated in Texas in the early 1990s (wiki it). This is a pretty Foodster idea though. You’re taking something so good, and so bad for you and making it even more worse but so much more delicious. Genius. Chicken Fried Bacon is available at Benoit Concessions west the Varied Industries Building. If you’re an early Iowa State Fair goer, then this is going to be the breakfast for you. I’d say pair it with a craft beer from the Iowa Beer tent, and you’ll be a true Iowa State Fair Foodster. 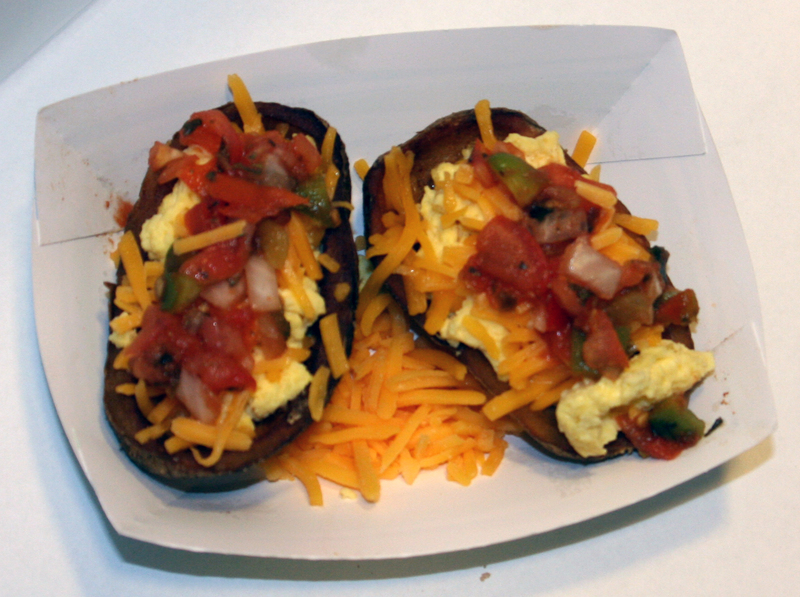 The Three Buck Bowl features two crispy potato skins filled with scrambled eggs, fresh salsa and shredded cheddar cheese. It’ll beat any breakfast from Taco Bell, or McDonald’s. You can find this breakfast, lunch, or dinner bowl – whenever you decide to eat it – at the Steer N Stein on the Grand Concourse. Love. Love. Love. 3 of the greatest things all in one bowl. This magnificent fair food is topped with chunks of smoked brisket and applewood smoked bacon and tossed in a three cheese sauce. It’s easily a Foodster’s choice because of how unique and tasty the bowl is. Head over to the Rib Shack to indulge. Wait, what? Something that isn’t dipped in hot grease on a stick? What a refreshing treat on a stick though. On a hot, greasy summer day at the state fair a caprese salad is probably the third thought on your mind after a cold beer, and finding A/C. This is totally Foodster because when you’re at the fair, you’re suppose to break the rules of healthy but this one keeps healthy state fair goers healthy. Enjoy cherry tomatoes, fresh basil, mozzarella cheese and balsamic vinaigrette. Available at all Salad Bowl locations.